No, it’s not just to get your attention, Archives publiques libres is a group of people who believe archives should be free to search to all, and that, by the same token, if you put your information online to share with others, it is not so a company grabs your info to sell to others. 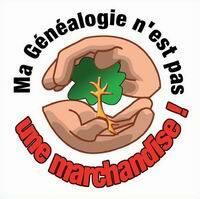 I really appreciate their inventory of free genealogical resources: simply click on maps and access lists fromFrance and around the world. You can also find press releases, tips for using internet etc. Previous postHiding to read that kind of newspaper?